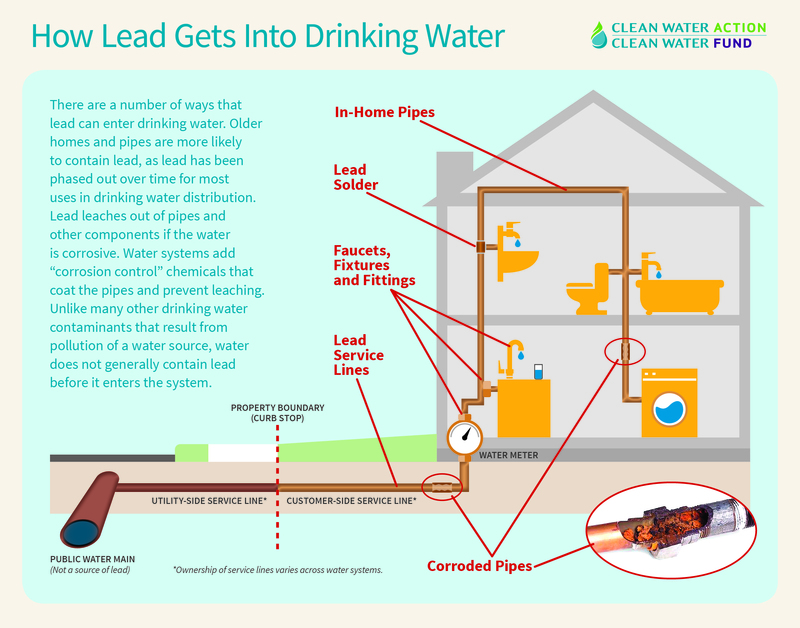 The American Water Works Association estimates between 6-10 million homes are connected to a lead service line. Lead exposure isn’t good for anyone; but pregnant women and young children are most affected. Physical and behavioral effects of lead occur at lower exposure levels in children than in adults. A dose of lead that would have little effect on an adult can have a significant effect on a child. In children, even very low levels of exposure have been linked to brain and nerve damage, learning disabilities, and lifelong growth, hearing, and blood problems. Lead is stored in our bones and builds up in the human body over time. For women who are pregnant, when calcium is released from the bones to the fetus,lead is as well.. Exposure to lead in the womb has been linked to stunted fetal growth as well as premature birth. It’s bad for adults too. 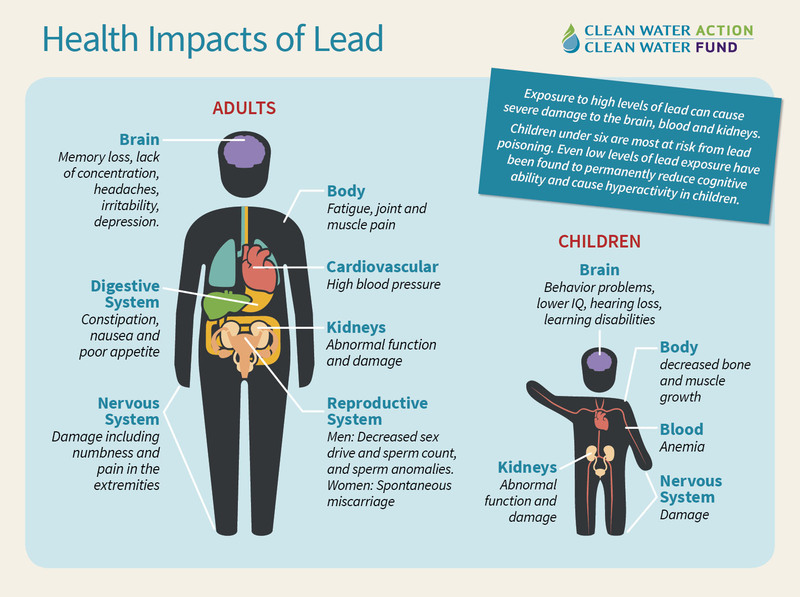 Even low level lead exposure can lead to heart problems, increased blood pressure, decreased kidney function, and reproductive issues in both women and men. As lead service lines age, they naturally corrode. While anti-corrosive chemicals are used to treat drinking water before it is delivered to homes, some amount of corrosion is inevitable. Lead particulates break off from the inside of the pipe and are transported in the water, out through the tap, and into our bodies. The current EPA standard for lead in water is 15 PPB. But EPA health goal is zero due to the many risks to human health that exist at any level of lead exposure. For instance, health impacts have been recorded for formula fed babies at just 3.7 parts per billion. Aging lines also make water treatment a higher stakes game. Since different sources of water have different levels of acidity, some water is more corrosive than others. If water sources change and water treatment isn’t adjusted accordingly, we are in danger of seeing the same level of mass lead exposure that occured in Flint, Michigan. Inventory: Before communities can replace their lead service lines, they have to know where all of them are. Unfortunately good records (or any records) don’t always exist. Cities need to invest the time and resources investigate lead sources, update records, and then provide this information to community members in accessible ways. Clean Water Action is advocating for multilingual, interactive, online lead service maps to become the standard across Massachusetts. Cost of Replacement: The city only owns the line up until the property boundary at the curb. For this reason, at least half of the cost of replacement has historically been placed on homeowners. This leaves low income homeowners as well as renters specifically vulnerable to continued lead exposure. Access to clean drinking water shouldn’t depend on your income, which is why we are calling on cities to cover the full cost of lead service line replacement so that everybody has the opportunity to limit their exposure to lead.